Pedestrian friendliness isn’t always something that can be measured. 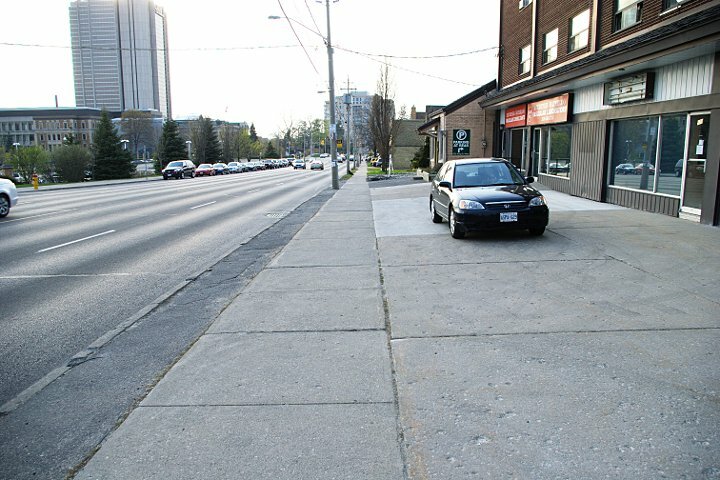 Many streets in Kitchener-Waterloo lack sidewalks, but other streets, even those with sidewalks on both sides, remain hostile to pedestrians in more subtle ways. To see whether or not a street truly welcomes and respects its pedestrians, you need to get out and walk. 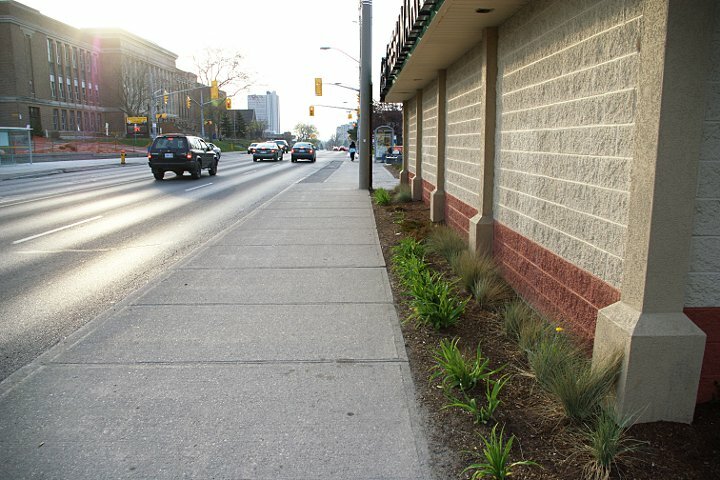 This post serves as a photo-document of a pedestrian trip from the northwest end of downtown Kitchener along King Street West to the Waterloo border. I live near this route and walk it frequently. This stretch of King Street is the first of Kitchener’s mixed-use corridor zoning areas, which aim to shape development to support higher-density, pedestrian friendly streets with a mix of complementary uses. Over the long term, Kitchener’s planners hope that the mixed-use zoning will help bring vitality to the street. 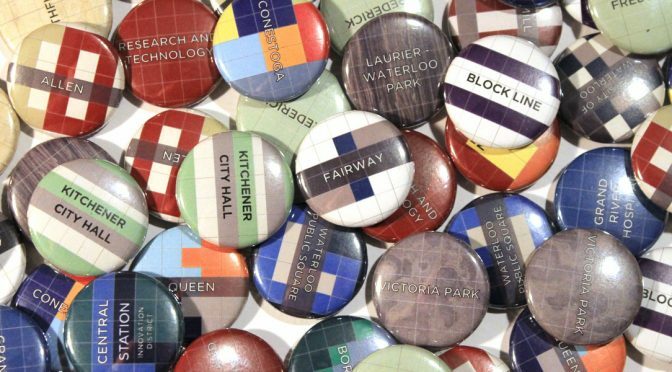 In the short term, what is holding King Street West back? Let’s go for a walk and find out. The walk starts well. 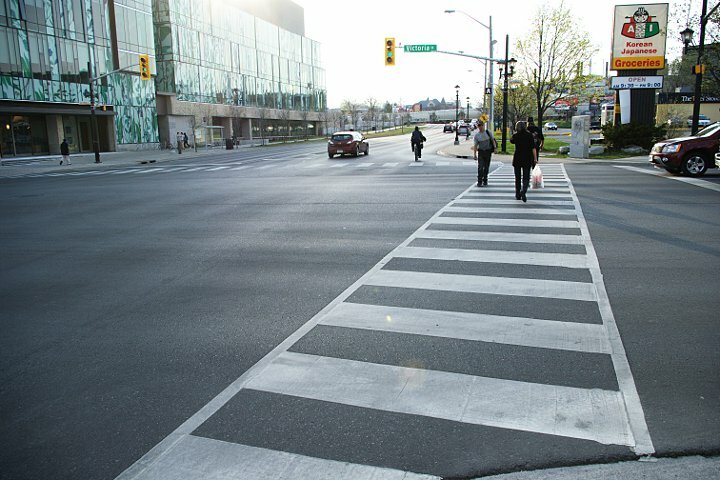 There is a wide zebra crosswalk at Victoria Street, the only one on this route and one of the few in the region. On the far side of the intersection there is a fairly new sidewalk with attractive lampposts on the road side. 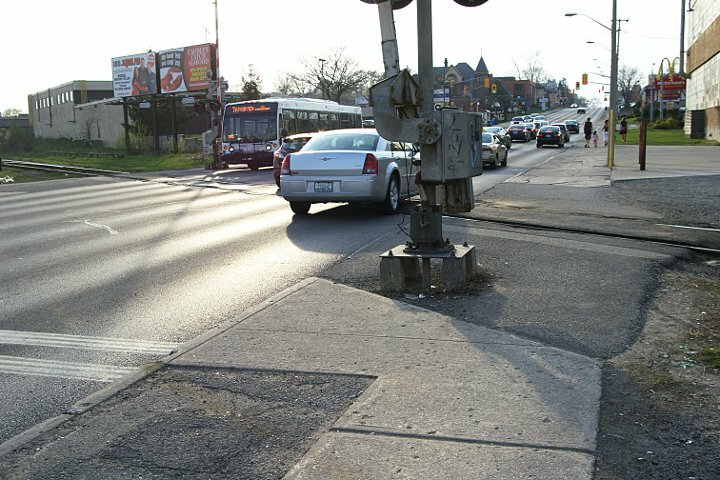 At the railway tracks, the concrete sidewalk ends and is replaced with uneven asphalt. The railway crossing gate blocks part of the sidewalk. The concrete sidewalk is badly cracked. It probably hasn’t been replaced for decades. This may not be a barrier to most pedestrians, but it gives us the impression that we are unwelcome, that those responsible for maintaining the street are content to let its pedestrian infrastructure decay. 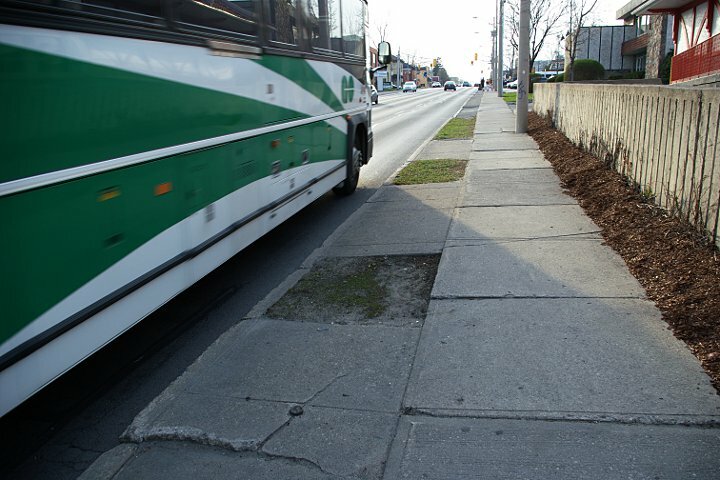 Here, the sidewalk is squeezed between a fast-moving lane of traffic and a concrete retaining wall. 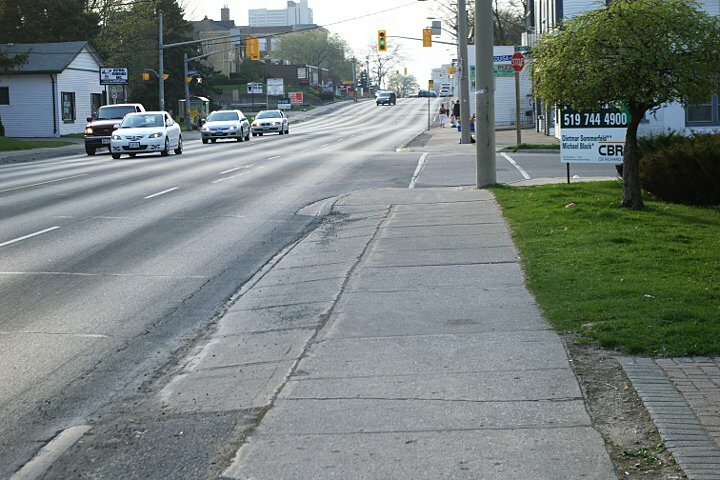 The width of the sidewalk could be nearly doubled by extending it to the edge of the road, but instead pedestrians must step into dirty patches of grass to pass a group of people or a wide stroller. Because of the speed and proximity of traffic, you can’t help but feel a bit uneasy walking here. Low curbs don’t help. 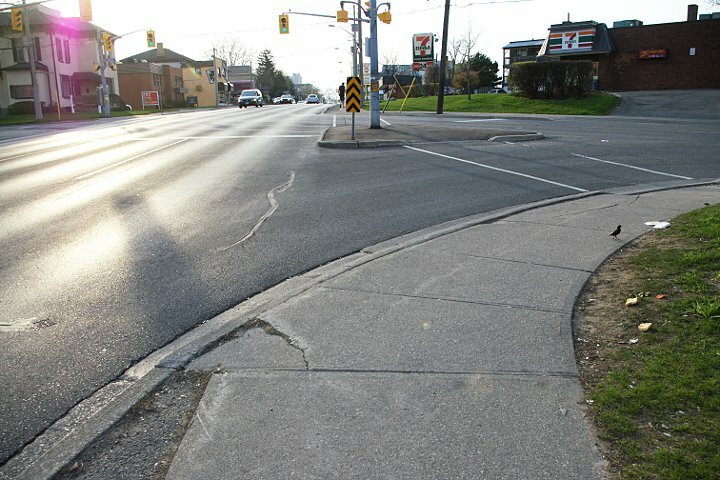 In many places, the sidewalk is only two or three inches above the surface of the roadway. 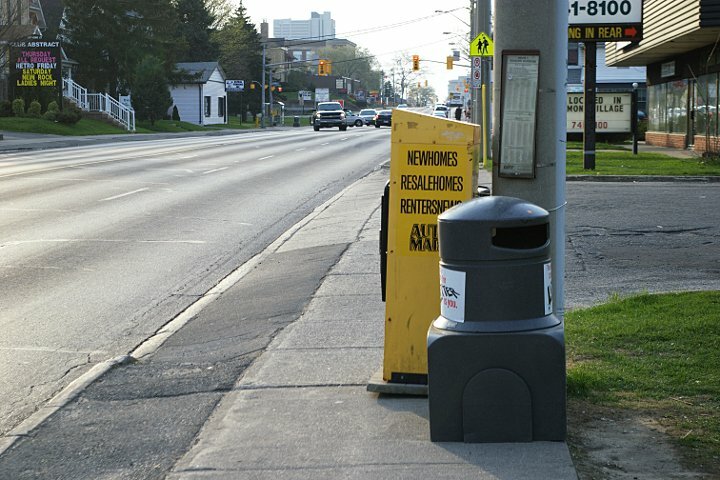 A garbage can and advertising boxes block more than half the width of the sidewalk. Here there is no curb at all. What purpose could this ramp up to the sidewalk possibly serve? The sidewalk has fallen — rather literally — into a state of disrepair. It seems to be sinking under the road, and an ancient asphalt repair is rotting away. The sidewalk by Central Fresh Market is pleasantly wide and well maintained. But why is that big blank wall facing the road? It could make a wonderful urban storefront. Dirt and gravel are covering the sidewalk. When it rains, the sidewalk turns to mud. This parking area seems to exend right onto the sidewalk. Is this a barrier to pedestrianism? No, not really. But like many of the situations I’ve highlighted in these photos, it makes a pedestrian feel vaguely uncomfortable, as if perhaps he or she is not really welcome here. 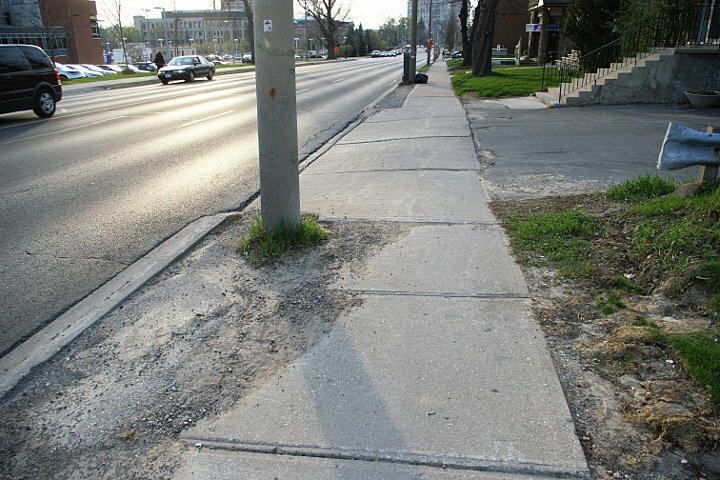 I hope these photos have succeeded in illustrating some of the ways a road can be unfriendly to pedestrians, even when equipped with sidewalks. Some of the problems I highlighted are small — but they add up to an uncomfortable (and sometimes unsafe) pedestrian experience. A true complete street should feel as if it is designed for pedestrians just as much as it is designed for motor vehicles, and King Street West fails badly in that regard. I was a KCI student for all of high school, and am intimately familiar with this streetscape. In a way, it seems like this is the road that time forgot – it’s been there so long, nobody thinks about reworking it into something that could be better. They re-paved much of the roadway about a year or two ago, but that involved only stripping the top inch or so of asphalt and repaving – there was next to no work on the sidewalk itself. The new bus shelter opposite Central is a true standout, because it’s the first real change I can recall there for quite some time. 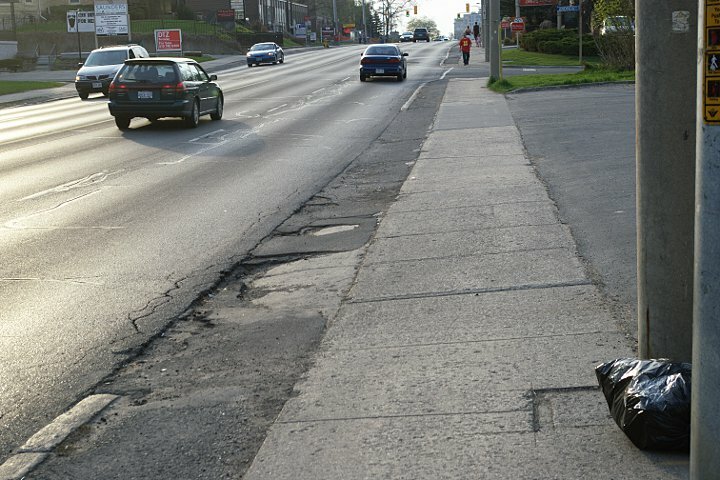 This is a great analysis of a sidewalk that has been forgotten in the Region. Thanks for clearly documenting what most of us who walk this stretch feel. 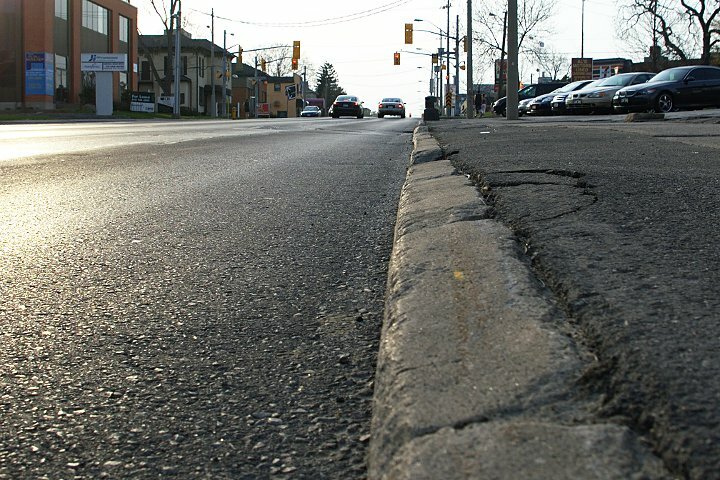 I would love for this to be shown to the City of Kitchener or Region (whoever is responsible for that stretch of King)! Great overview – one item that might indicate that you are stretching just a bit and heading into the blight of busybody complainer would be the trash can comment – there is a rather simple fix for this – as for the rest of your complaints – these are private enterprise – they can do as they please – especially the railway – they have special exemptions that date back to Sir John A. When you add walls of plowed, frozen, banked-up snow, those narrow stretches of sidewalk become both impossible to navigate and dangerous, with speeding cars and buses only inches away. 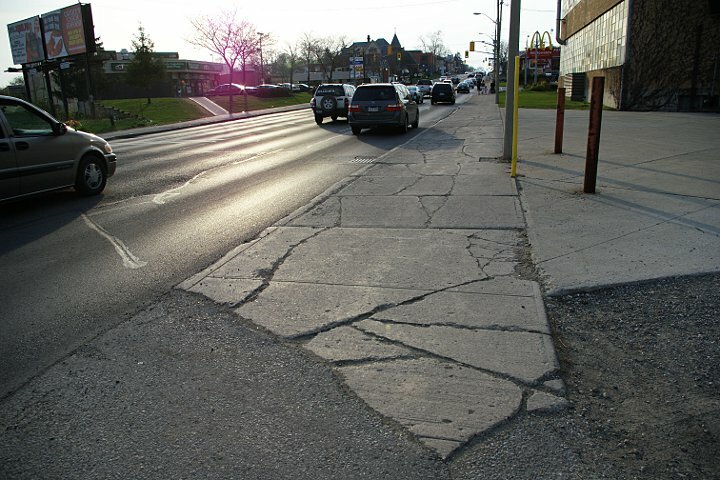 The sidewalks will be fixed when the changes are done for the LRT. So it is also waiting for the Federal money.